Walnuts have a similar shopping effect on me like pumpkins, I have to buy them every week! I always keep a little bowl in my kitchen and sometimes a second one in the living room filled with nuts and a nutcracker right at hand. I’m not really the kind of person who decorates the flat according to the seasons but I love to have this kind of food around me as it brings a piece of autumn right into our home. There’s something about walnuts, the way they look, the smell and the ritual of opening them that puts me in a cosy mood! 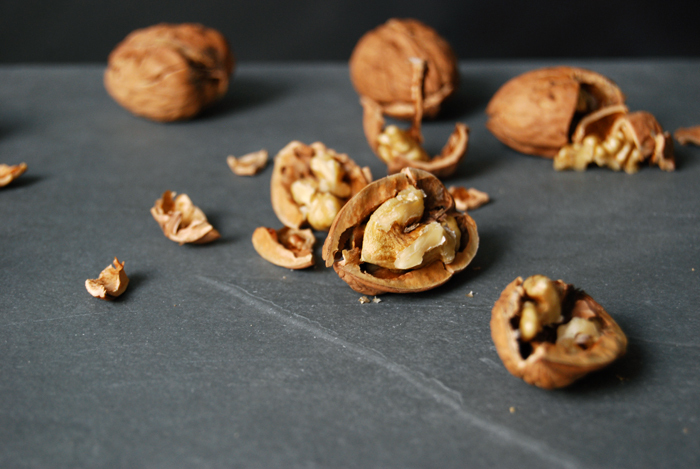 We eat most of the walnuts straight out of their shells as I don’t need them for many of my recipes. I don’t really use them in my baking either as I’m not too fond of walnuts in cakes or cookies, it’s just not my thing. Sometimes I like to sprinkle them over salads, sandwiches or soups for that earthy flavour, but there is one recipe I can’t have enough of: Walnuts crushed into a pesto! I mix them with thyme, garlic and good olive oil and let them spread their aroma in warm spaghetti with some parmesan on top! It’s so simple and it tastes fantastic! 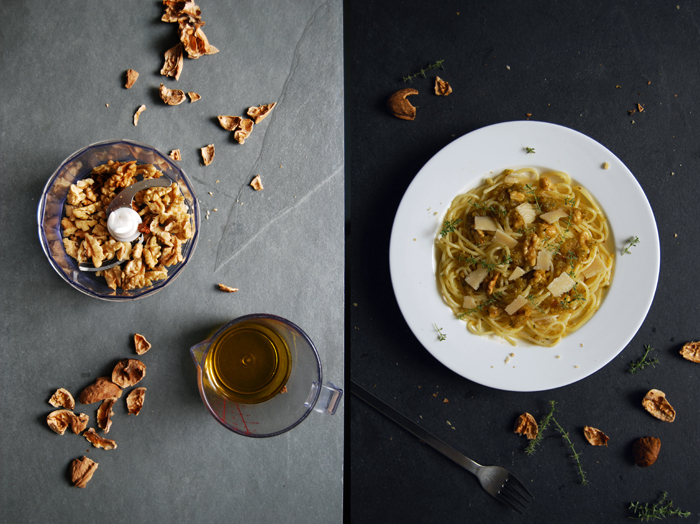 A while ago, I made this pesto with parsley for my pumpkin gnocchi, a recipe that features both of my favourite autumn beauties, pumpkin and walnuts! It’s a bit more time consuming but it’s absolutely worth it! Purée the walnuts, thyme, garlic and olive oil in a blender and season with salt and pepper to taste. Add more olive oil if you prefer the pesto more liquid. 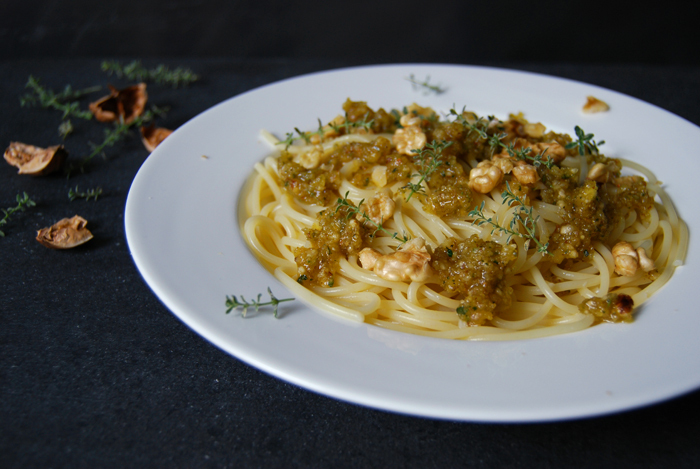 Season with thyme to taste and mix with the warm pasta on the plates (preferably warmed up in the oven). Sprinkle with parmesan. 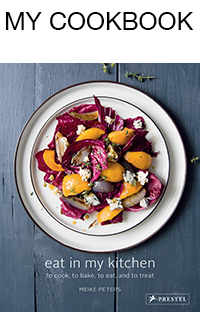 Meike, you always come up with unusual combinations that sound so delicious! I can’t wait to try this one. Thanks for sharing. 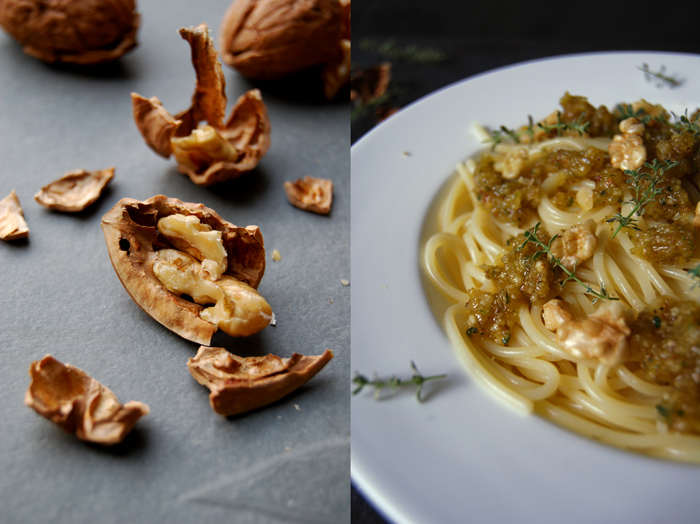 I’ve never thought of using walnuts in pesto but it sounds wonderful! I’m fond of pasta and your recipes with spaghetti are always original and full of flavors. I’ll test this one this week-end. It’s a good idea for diner after a long walk in the forest in autumn. Of course, I’ll use the Maltese olive oil I bring after my holidays in this island in September. We found our oil in Bugibba. Unfortunately, we didn’t buy as much as we wanted. Our suitcases were to small ! When the bottles will be empty… we’ll be obliged to go to Malta again ;-). I hope it’ll be in spring. I can’t wait. I’m sure that in few days, we’ll see on your blog new recipes with your mother in law food. Yum ! Your salad looks delicious Catherine! I wish my French was better 🙂 I love your kitchen traveling idea, it’s the best place to bring holiday memories back to live. This looks so delicious. I love walnuts and will definitely give this recipe a try. Great idea! 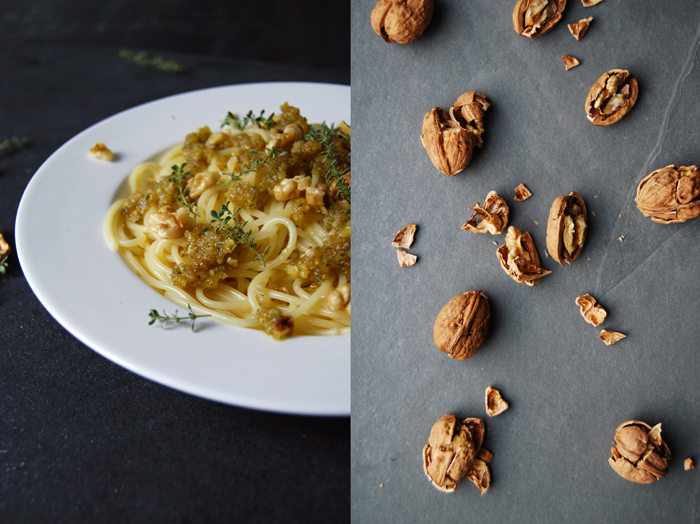 I was looking for something simple & savoury w/ walnuts.